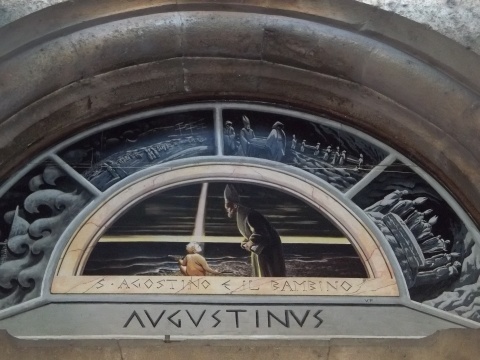 The Crypt can be visited on request by contacting the Church of Sant'Agostino. The crypt is actually what has come to us from the church and from the convent of the Augustinians; here the tradition identifies the place where they were kept, from 504 to 722 d. C., the mortal remains of St. Augustine, who came to Cagliari with the arrival of Fulgenzio di Ruspe and other bishops from North Africa. The cave, in all probability, already used in Roman times, became a place of worship and crypt of a Gothic style church built in the fifteenth century, with an adjoining convent dedicated to the saint. In the second half of the sixteenth century, both the church and the convent were demolished to allow the works ordered by Philip II of Spain, for the renovation of the city walls. The King commissioned the construction of the new temple and the new convent, both erected in Marina district. Of the ancient church remains only a small chapel, above the crypt. At the end of the nineteenth century the chapel was demolished to make room for Palazzo Accardo and only the ancient crypt remained. Inside you can admire a marble altar in classical style that, by the will of Elena Brondo, marquise from Villacidro, was erected in honor of the place where the body of the saint was kept. In a niche there is a statue that depicts him; the frontal is also visible with a low relief depicting Saint Augustine between two angels; the inscription concerns the erection's date of the altar. At its back can be found the cavity which, according to tradition, contained the relics of the saint; the small water source here, was once considered miraculous.